On March 20, 2015 IARC released a report (Monograph 112) assessing the carcinogenicity of 5 pesticides (glyphosate, malathion, diazinon, tetrachlorvinphos and parathion). The Monograph evaluation as it is called relied on expert panels doing a comprehensive review of the latest available scientific evidence including laboratory animals studies and human population studies from the scientific literature. The herbicide glyphosate was classified as probably carcinogenic to humans. In addition glyphosate was associated with non-Hodgkin’s lymphoma in humans. The insecticides malathion and diazinon were classified as probably carcinogenic to humans. The insecticides tetrachlorvinphos and parathion were classified as possibly carcinogenic to humans. All 5 of these pesticides evaluated at this time are organophosphates. Glyphosate, active ingredient in Roundup, currently has the highest global production volume of all herbicides. The largest use is in agriculture. The agricultural use increased sharply since GMO crops were created with resistance to glyphosate’s herbicidal effect. Glyphosate is also used in forestry, as well as urban and home applications. Glyphosate has been detected in the air during spraying in water and in food. Malathion is currently used in agriculture, public health and residential insect control Diazinon is applied in agriculture. Home and garden use declined after 2006 due to restrictions in the US and European Union. Tetrachlorvinphos is banned in the European Union. In the US it continues to be used on livestock and in pet flea collars. The most widely used herbicide, glyphosate and 4 other organophosphate insecticides, when the evidence was examined, were nearly all found to have damaged DNA and/or chromosomes and to be linked to some degree of carcinogenic effect in humans. 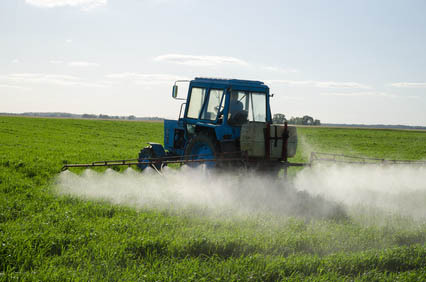 For pesticides in general there is evidence suggesting that human exposures are linked to development of Parkinson’s disease, other neurologic conditions, nonmalignant respiratory disease, as well as immune system and developmental effects. Although some uses of certain individual organophosphate chemicals (for example chlorpyrifos, and diazinon) have been restricted in the U.S. and overall pesticide use has declined significantly in certain European countries (Denmark , Sweden, The Netherlands), use of pesticides in general in the US is still very high and the pesticide use in developing countries is increasing dramatically. Finally, with the exception of organochlorines, there continue to be uses of certain organophosphates, carbamates, pyrethroids as well as newer chemicals like fipronil and imidacloprid and other neonicotinoids here that have not been well researched for chronic toxic effects. Given the need for further research on the risks that chemical pesticides may pose to human health, their use for keeping dandelions out of our yards should be weighed carefully by the public. Citizens have the opportunity to endorse a measure that minimizes such exposures by restricting certain hazardous chemicals for cosmetic pesticide uses on lawns in Montgomery County, Maryland. The proposed legislation from Council President George Leventhal deserves support by residents who care about protecting human and environment health. Further, it seems reasonable for the US government to consider reviewing its standards for registering chemical pesticides or at the very least reconsider registration conditions for the chemicals included in the recent (March 20, 2015) monograph from the IARC.